Mysuru: The campaigning has reached feverish pitch in one of the most high profile constituencies, the Chamundeshwari, in which Chief Minister Siddharamaiah and his friend-turned-foe G.T. Devegowda (GTD) have locked horns. Thus, this constituency has drawn the attention of even the national and international media, as it is a do-or-die battle for the Chief Minister, who has declared that this is going to be his last electoral battle. As the public campaigning ends today evening by 6 pm, the JD(S) candidate Devegowda and Congress leaders in the absence of Siddharamaiah, yesterday took out road shows in Naganahalli, a part of Chamundeshwari constituency. 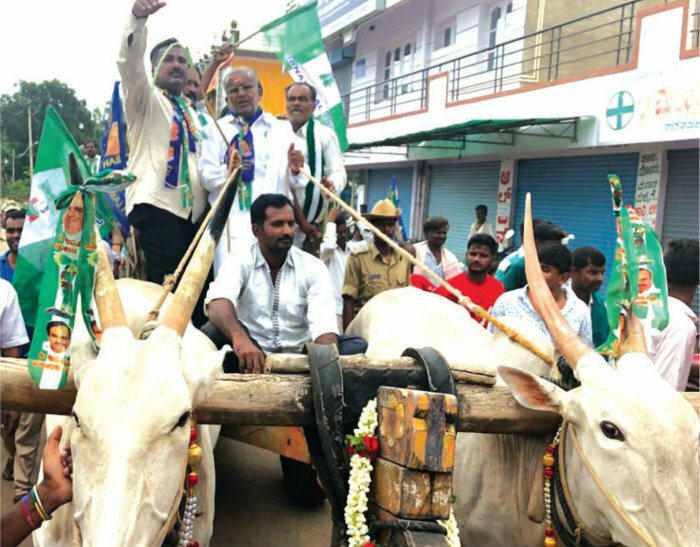 GTD trying to attract the attention of the voters in this predominantly rural belt went on a bullock cart through the village streets on a Road Show and leader Kumaraswamy joined JD(S) at this time. GTD was welcomed by JD(S) and BSP party workers and he was taken to Prasanna Ganapathy Temple, where he performed special pujas. Addressing the gathering, he claimed that he and former Chief Minister H.D. Kumaraswamy were sons of the village. Lauding the achievements of the JD(S) State President during his 20 months rule as Chief Minister, he asked the voters to support JD(S). Congress Rally: After the JD(S) Road Show, the Congress workers began their padayatra at 12 noon after performing special puja at Ganapathy Temple. The workers, holding the party flag, condemned the attack on them by the JD(S) workers recently. Former Karnataka State Women’s Commission Chairman Manjula Manasa, addressing the gathering, alleged that the JD(S), scared of losing, had resorted to attacks on the Congress workers in the village. CM Siddharamaiah with his many schemes like Anna Bhagaya and Ksheera Bhagya had addressed the issues of the poor and hence asked the voters to bring back Congress to power. Actor Madan Patel, District Congress President Dr. B.J. Vijaykumar, former Zilla Panchayat Member Nandini Chandrashekar and others participated in the Road Show. 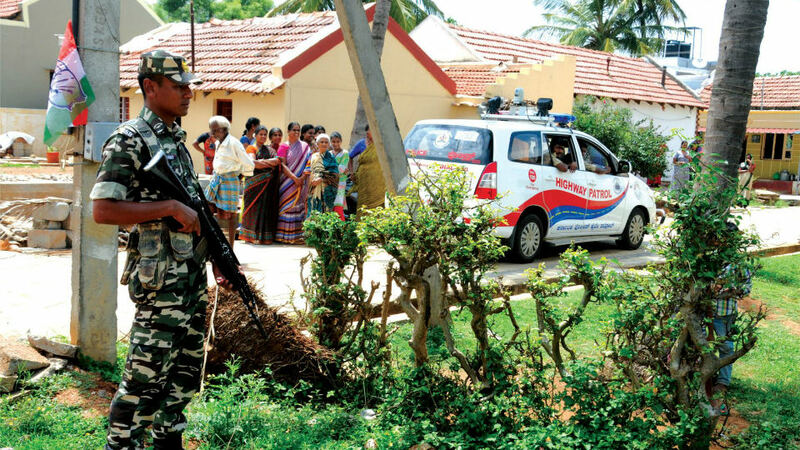 Tight security: Due to the clashes that occurred in Naganahalli between the JD(S) and Congress workers recently, one contingent of the Paramilitary Force has been deployed to keep a strict vigil in the Constituency to see that such incidents do not recur. A CAR contingent was also deployed for some time. both will fail miserably. congres will even loose deposit.